Get a head start on your MJ Crafts Design Studio St. Valentine's Day shopping as we won't be able to fill orders during the month of February. We are moving back to the states from overseas, after retiring from a 24-year career in the US Air Force. 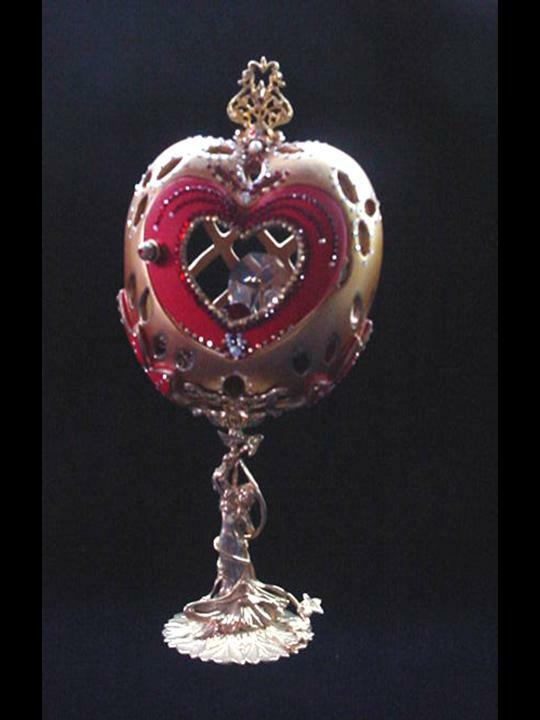 Dimensions: About 10.75 in x 8 in Description: This handmade ornament is hand crafted in Copper with blown glass beads. Each detail is created based on the artist's perspective and creative freedom of expression. Beautiful for garden, terrace or home accent decor.Unique Design! 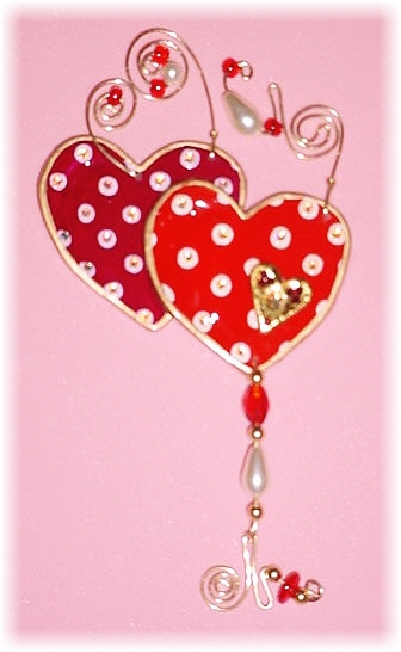 Dimensions: About: 8.5 in h x 4 in wDescription: Front red heart door opens. Inside, one large drop AB Austrian Crystal and red heart shaped crystal, both resting on a red velvet pillow with gold color details. This piece was imperial gold color and red satin finish. Accented with AB Austrian Crystals and red Ruby crystals. 18K gold plated stand and fidings.Decorated box available for this eggypiece. Dimensions: About 9-10 in longDescription: Handmade with glazed Fimo. Embellished with Austrian crystals. Leather cord, nickel wire and silver plated findings are used for final details. Perfect to match with any personal style. Other designs and colors will be available soon!!! Dimensions: About 4.5"h x 2.5"w(including the beaded wires)Description: This porcelain handmade ornament is painted in bright colors and gold enamel details. Embellished w/AB and Ruby Austrian Crystals. Glass beads and pearls are used. Also, gold color wire is used for final details.Express your feelings with this unique gift! These are but some of the beautiful crafts at MJ Crafts Design Studio. Don't forget to use the Site Map, Site Map 2 if you have questions on what to find. Also, if you have a quality related site, link with us at our VIP Art-Handmade Crafts-Gifts Related Sites Directory. As always, it is a pleasure for us to have you as a visitor! 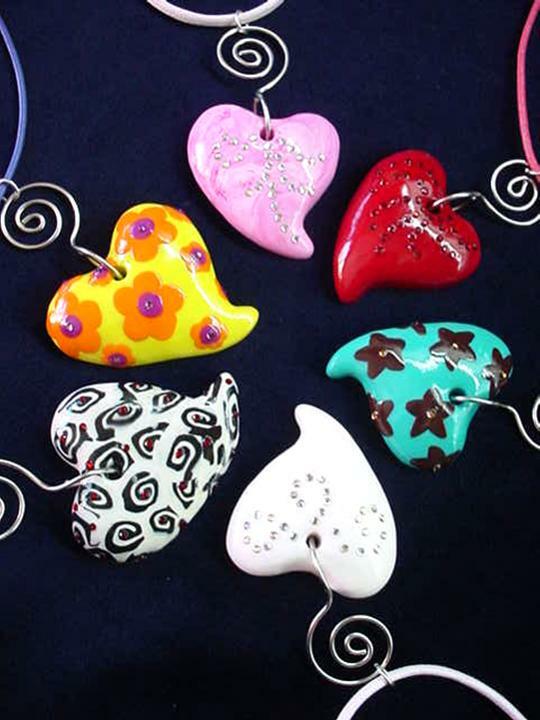 All Handmade Crafts-Handcrafted Gifts-Decorated Eggs Art Gallery- MJ Crafts Design Studio features the Eggypiece Art Collection, beautiful and funny FIMO Polymer Clay creations, and many more 100% handmade crafts made out of ceramics, porcelain, wire, beads, and polymer clay. Very unusual! PayPal and Family Friendly. Come and Visit Us!